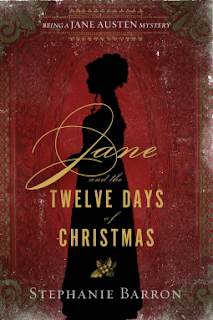 "Jane Austen turns sleuth in this delightful murder mystery set over the twelve days of a Regency-era Christmas party. Christmas Eve, 1814: Jane Austen has been invited to spend the holiday with family and friends at The Vyne, the gorgeous ancestral home of the wealthy and politically prominent Chute family. As the year fades and friends begin to gather beneath the mistletoe for the twelve days of Christmas festivities, Jane and her circle are in a celebratory mood: Mansfield Park is selling nicely; Napoleon has been banished to Elba; British forces have seized Washington, D.C.; and on Christmas Eve, John Quincy Adams signs the Treaty of Ghent, which will end a war nobody in England really wanted. Jane, however, discovers holiday cheer is fleeting. One of the Yuletide revelers dies in a tragic accident, which Jane immediately views with suspicion. If the accident was in fact murder, the killer is one of Jane's fellow snow-bound guests. With clues scattered amidst cleverly crafted charades, dark secrets coming to light during parlor games, and old friendships returning to haunt the Christmas parties, whom can Jane trust to help her discover the truth and stop the killer from striking again? Jane Austen is one of my favorite authors of all times. Period. I love her writing style and the lasting impression she left on the literature world. I have long been a fan of anything having to do with Jane Austen and her books and when Stephanie Barron began writing this series long ago, I was an avid reader. It is very interesting to read about Jane and her personal life that she kept so secluded and add in a twist of a murder mystery, well I am instantly hooked. This book is the 12th installment of the long-beloved Jane Austen Mysteries. For some reason, I feel that I have read somewhere that this series is coming to an end, but I might be wrong. In fact, I hope that I am wrong, because this series has been one that I continuously return to time and time again. In this book, Jane and her family have been invited to stay with friends for the Christmas festivities. Jane is eager to spend time with her friend and enjoy the holiday season. Of course, with Jane around, there is a murder and a puzzle that she must use her sharp wits and intelligence to solve. When one of the guests is found dead in what appears to be an accident, Jane's sharp eye determines that this was no accident. She is determined to find out what happened and who wanted this guest dead and why. With the help of her family and friends, she seeks out a murderer. As I stated before this is the 12th installment in this series. I found that this book was just okay in comparison with the others in the series. I enjoyed this book, but the mystery seemed to lack the enjoyment for me as the previous books. Not a bad read, just not exactly what I was expecting. I enjoyed returning to this series and am currently reading the next installment, Jane and the Waterloo Map. It has been a couple of years since I have read this series, and maybe that is why I felt that the story in this one was just okay. I am hoping the next installment will be better. I didn't know about this series. I love Jane Austen books and I always get excited about spin offs. I haven't read any books that have Jane Austen as a character so I am excited to read this series. I really liked this Christmas book. Waterloo Map wasn't quite as good. Jane is nearing the end of her life but I don't know if Stephanie Barron has decided what to do with the series yet. I think Jane could have another mystery or two to solve. I am the complete opposite. I am enjoying reading Jane and the Waterloo Map. In fact, I am liking this book a lot more than the Christmas one. I think it is because Henry makes an appearance. Out of Jane's brothers, he is my favorite. I also realized that Jane's death is nearing closer and I am hoping that there are more books in the series to look forward to. I love this series and do not want it to end.